4th Group Stage match of CLT20 2014 was played between Sunfoil Dolphins vs Perth Scorchers at Punjab Cricket Association Stadium, Mohali, Chandigarh. 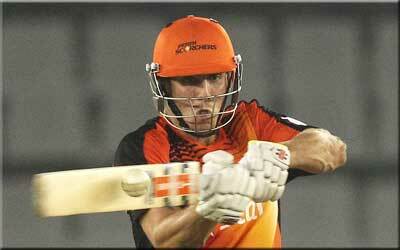 Perth Scorchers registered superb win on last ball of the match and open an account in points table tally of CLT20 2014. MR Marsh hits 2 sixes in last 2 balls and disappointed Dolphins as well. He Declared man of the match for his match winning inning of 40 runs. Earlier Dolphins won the toss and elected to bat first and set target for PErth. The decision not seemed to correct initially as Dolphins lost top 3 batsmen in first 9 balls. KA Maharaj and K Zondo came in middle and revived Dolphins inning as well. K Zondo played superb inning of 61* runs and managed to put decent score of 164 runs at the end of 20 overs. Following target of 165 runs, PErth made steady start but lost skipper early scoring 7 runs. CJ Simmons and SM Whiteman took the charge and played sensible cricket initially. both played well and made 48 and 45 runs respectively. MR Marsh came in middle and played good inning of 40* runs of just 26 bals with 3 fours and 2 massive sixes hits on last two deliveries of the match and gave Perth remarkable win by 6 wickets. MR Marsh (Perth Scorchers) declared man of the mach for his 40* runs of 26 balls and for his 2 sixes in last two balls of the match.